In this assignment we'll add a way for our player to count the collectibles they've picked up, and to display a "You win!" message once they've collected them all. store the value of our counted collectables. and open the PlayerController script for editing. of collectables we've picked up. we won't be collecting partial objects. And let's call it Count. first start with a count of 0.
when we pick up a new object. We need to set our count value to 0.
for use within this script. it's starting value here in the script. we will do it in the Start function. to be equal to 0.
when we pick up our collectable game objects. So this is where we add our counting code. We'll type count = count + 1.
and this is the one that we're going to use in this assignment. Let's save our script and return to Unity. when the game is over. from the hierarchy's Create menu. We seem to have gotten more than we've bargained for. and an EventSystem game object. and press the F key to frame select it. relative to the entire canvas. to reset the rect transform. customise this element a bit. so it's easier to see. the blue value to 0.
or entering the values numerically. in this case the canvas. 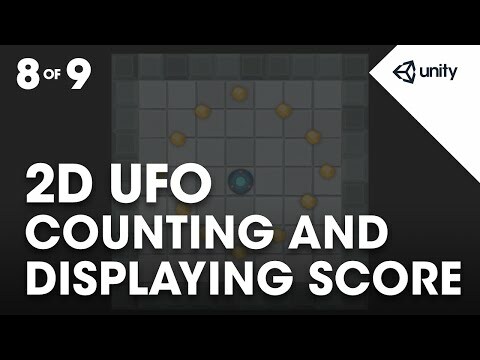 other game objects in Unity. rather than to it's centre. position based on the new anchor. and select the upper left preset by clicking on it. the corner of the game view. text and the edges of the screen. set our pivot to the upper left corner as well. yet it's still up and out of the way. our script more about them. on our UI Text game object. of the UI text's Text property. WE can do this in Start as well. And we need the parenthesis. for us to set the text with. twice in the same script. This is generally bad form. every time we need it. and an empty set of brackets. in to the function by cutting and pasting it. a line of code simply calling the function. other line with the function call as well. Save and return to Unity. has a new text property. Let's save the scene and play. these objects but we can count them now. when we have collected all of the pickups. make a new UI text game object. automatically added to our canvas. cover the Player game object. to the centre of the canvas. A value of about 75 feels good. we used for our previous text element. by setting the font size to 24.
back to our scripting editor. variable and call it WinText. Let's save this script and return to Unity. controller has a new UI text property. game object in to the new slot. collected 12 objects we display the You Win! text. using a stand alone player. //Adding this allows us to access members of the UI namespace including Text. public float speed;             //Floating point variable to store the player's movement speed. public Text countText;          //Store a reference to the UI Text component which will display the number of pickups collected. public Text winText;            //Store a reference to the UI Text component which will display the 'You win' message. private Rigidbody2D rb2d;       //Store a reference to the Rigidbody2D component required to use 2D Physics. private int count;              //Integer to store the number of pickups collected so far. //Get and store a reference to the Rigidbody2D component so that we can access it. //Initialze winText to a blank string since we haven't won yet at beginning. //Call our SetCountText function which will update the text with the current value for count. //FixedUpdate is called at a fixed interval and is independent of frame rate. Put physics code here. //Store the current horizontal input in the float moveHorizontal. //Store the current vertical input in the float moveVertical. //Use the two store floats to create a new Vector2 variable movement. //Call the AddForce function of our Rigidbody2D rb2d supplying movement multiplied by speed to move our player. //OnTriggerEnter2D is called whenever this object overlaps with a trigger collider. //... then set the other object we just collided with to inactive. //Add one to the current value of our count variable. //Update the currently displayed count by calling the SetCountText function. //This function updates the text displaying the number of objects we've collected and displays our victory message if we've collected all of them. //Set the text property of our our countText object to "Count: " followed by the number stored in our count variable. //... then set the text property of our winText object to "You win!"